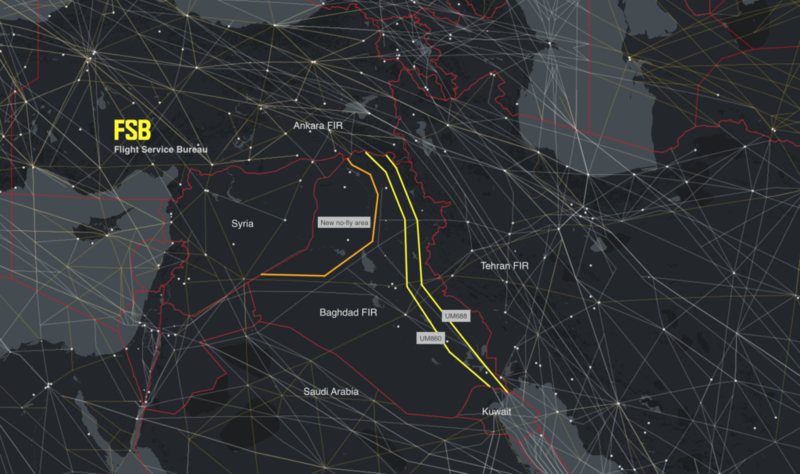 So, last week we told you that Iraqi Airspace was about to re-open to international overflights. It still is, though the bit where it was going to happen this week is no longer true. But then, a military operation by Iraqi forces to take control of Kirkuk from the Kurds the same day, created concern as to overflight safety. Kirkuk sits pretty much underneath the UM860 airway on the map below. So for now, do nothing and wait. It seems the situation is de-escalating, and we expect now that the Notam may be issued as early as next week. Once that happens, we’d expect other countries to follow suit and allow overflights in the same way, meaning that these two airways will become busy again. Keep an eye out, we’ll let you know.